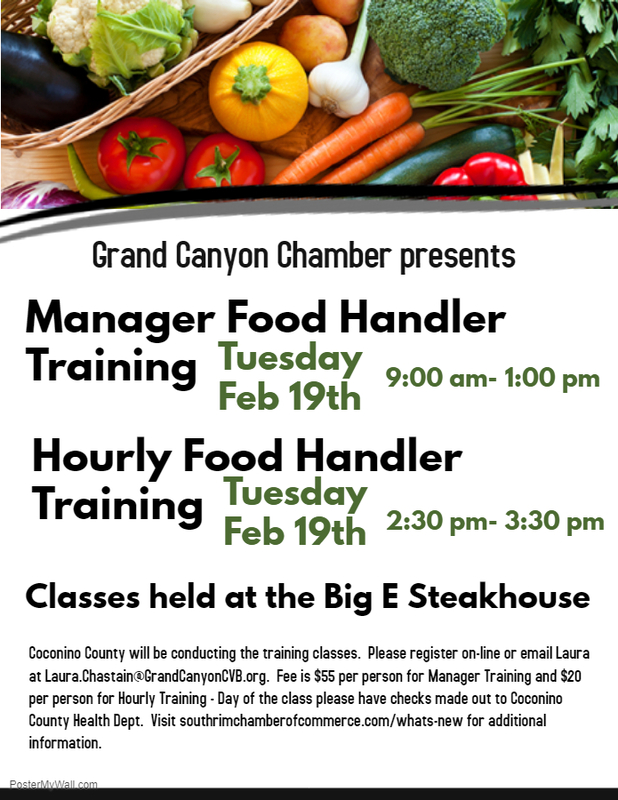 TUSAYAN — The Grand Canyon Chamber will present “Manager Food Handler Training” from 9 a.m.to 1 p.m. and “Hourly Food Handler Training” from 2:30 to 3:30 p.m. Tuesday, Feb. 19 at the Big E Steakhouse, 395 AZ-64, Tusayan. Coconino County will be conducting the training classes. The fee is $55 per person for Manager Training and $20 per person for Hourly Training due on Feb. 19. Checks can be made to the Coconino County Health Department. Register online or via email to laura.chastain@grandcanyonCVB.org. Visit https://southrimchamberofcommerce.com/whats-new for more information.